Queens, NY — An NYPD cop, who markets pro-police schwag to his fellow cops in his off time, is becoming internet infamous after he allegedly posted a ridiculously fascist and tyrannical shirt photo that praised the arresting of protestors and the money made while doing so. 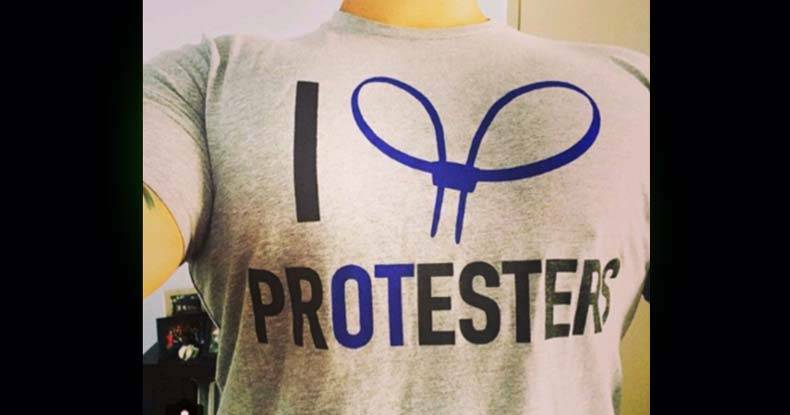 The shirt in question has a set of zip-tie restraints in the shape of a heart, with the letters ‘OT’ in ‘protesters’ highlighted. In short, Officer Matthew Langone, 40, of the NYPD, allegedly loves to arrest people for practicing their freedom of speech, as well as the windfall in pay stemming from the overtime involved — and officers have expressed enough support of that idea for Langone to market a t-shirt to them. When activist, Keegan Stephan came across the officer’s alleged Instagram account and saw the atrocious images, he decided to expose Langone. Upon further digging through the Instagram account, Stephan found that the “arresting protesters” shirt was just the tip of the iceberg. Since, Stephan has exposed officer Stephan, the Internal Affairs Bureau announced that they have launched an investigation into the officer’s conduct. One of the most disturbing posts he allegedly made was a meme of a soldier sitting at a table, staring at two weapons. “When you wanna pop off rounds in your neighborhood like the rest of the hood rats, but you gotta be responsible,” read the meme. He then wrote the words, “or do we” under the post. According to the New York Daily News, sources said the officer, who works out of Jamaica’s 103rd Precinct, hadn’t been suspended or placed on modified duty, in spite of the supposed investigation. The fact that the NYPD claims to have “launched an investigation” is ironic considering they e-silenced the person responsible for pointing out Langone’s alleged insanity. When Stephan attempted to alert the 103rd Precinct to these despicable posts, they blocked him on Twitter. I’m deeply disturbed by the reprehensible Instagram posts of a police officer in the 103rd Precinct, which covers a significant portion of my district. It’s completely unacceptable for someone who has sworn to protect our city to post messages advocating violence and referring to community members as “hood rats.” Such comments erode public confidence in our police and undermine our efforts to improve police-community relations. I urge the NYPD to take immediate disciplinary action and make it clear that such behavior will not be tolerated. Considering no action has been taken as of yet, and considering the fact that some of these posts were made from inside the 103rd Precinct, it appears that Councilman’s request for discipline, like the majority of police complaints, have fallen on deaf ears.